By Gordon Frickers 61 x 91 cm (24″ x 36″), oils on board, the original is in the main salon on board Clansman. 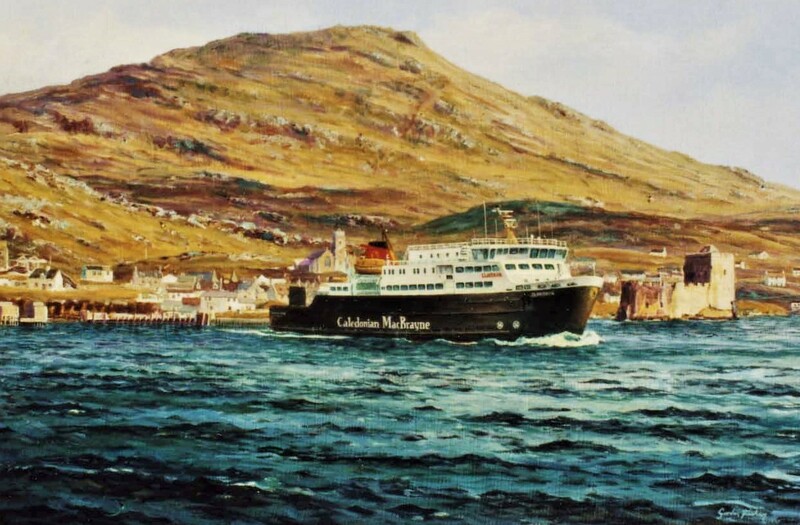 Princess Anne spent 15 minutes at the Caledonian MacBrayne Ltd naming ceremony of “Clansman” talking to the artist and suggested that he should be encouraged to paint more Hebridean scenes. A result was 2 further commissions from Calmac. 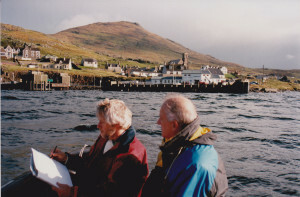 Today you can view “Clansman arriving at Castlebay, Barra” onboard ship in the main saloon of Clansman. If you are looking for the best in marine painting you have found it here. To acquire one of our museum quality prints on canvas, signed, numbered, or commission a similar painting, a pleasure to own, a sound investment, you can purchase in easy stages. “The print has just arrived …. “I have now received the print of ‘The Clansman arriving at Castlebay’, and I am extremely pleased with the result. How this classic painting was commissioned. 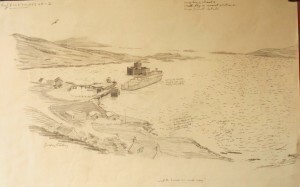 The artist’s brief was to create a series of 3 paintings, to show the new ship in her regular ports, at least one to be completed for the naming ceremony before the ship was launched. One for the main saloon of the ship, one as a gift for either the builders or the VIP who named the ship, and one for the company offices, all to be complete before the new ship was launched in time for the naming ceremony were they were to be displayed beside the GA drawings. 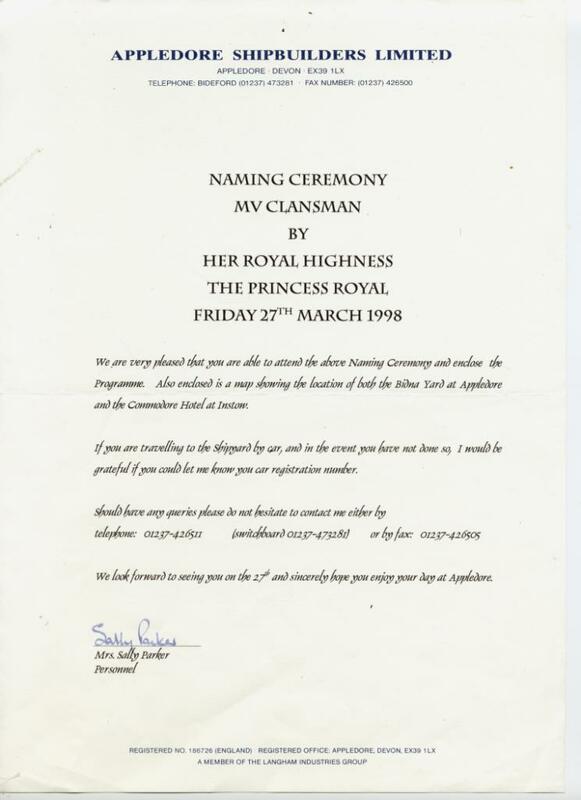 What we did not know when we started was the VIP was to be The Princess Royal, Princess Anne. 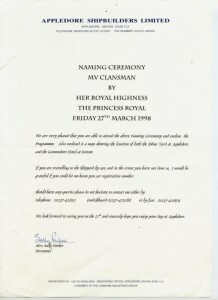 The Princess is quite a nautical person who knows well and loves the Western Isles, The Outer Hebrides. 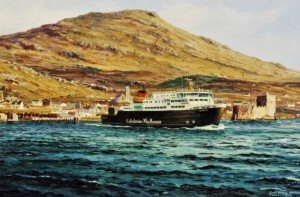 The artist was flown to Glasgow and met by the then managing director of Calmac, Captain John Simkins. 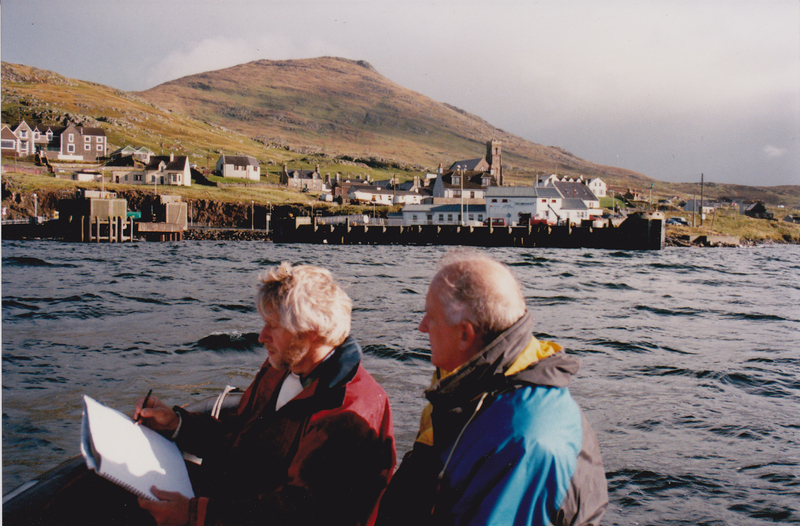 Together they sailed on the route from Oban to Barra that the new ship was destined to serve, to research for the paintings. The 2 men explored the islands for locations and views the artist could be satisfied with. The task included quite a bit of hiking up peaty boggy hillsides to consider some splendid scenery and a trip into the bay courtesy of the Castlebay Lifeboat engineer. Fortunately they were very well provided for by the owner of the Castlebay Hotel (castlebayhotel at aol dot com). 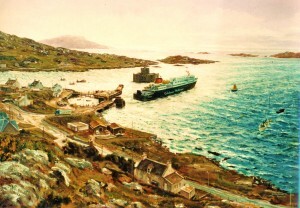 The paintings of Castlebay included changes and an extension that were going to be made to the pier heads to accommodate the new larger ship. All this was taken from engineering drawings supplied by the Calmac design office, placed in the painting to scale and in perspective, a difficult feat completed successfully, painted by the artist in time, in advance of the ship building being completed. Gordon Frickers even included the Barra RNLI lifeboat, a truck from Calmac’s biggest customer at Barra and the MD’s yacht in the painting. People intuitively notice the difference, when the artist has been on location, including those who travel on the ships and see the originals. The Princess Royal (Anne) who knows the islands very well was very impressed by the “Clansman” paintings, she particularly noted the colouring and light was very convincing, that the picture was very detailed yet had managed to avoid the trap of becoming “photographic” or static; she commented that it was remarkably fluid, mysteriously convincing yet painterly. While the artist can work very successfully from plans and photographs, there is a significant advantage when budget permits and you want the best, in his visiting the locations. This is an artist who loves to paint modern ships. Considering a commission? Talk to the artist. This splendidly atmospheric painting is displayed onboard Clansman in her saloon. This painting has superb paint texture for example look at the water around the ferry. The location is Barra, Outer Hebrides, sometimes romantically called “The Western Isles”, Scotland. We have had several requests for prints so it is now available in open edition, signed by the artist, prices including framing. Often noted for its beauty, Barra, Southern most of the Western Isles, nestled at the foot of the Outer Hebridean chain Barra is only five miles across by eight miles long, with a ring road all the way around. Barra is a compact paradise with stunning coastal scenery and a mild climate. The island has white sandy beaches, often deserted, that would not look out of place in the Mediterranean, remarkable wildlife, diverse flora and fauna good food and excellent Scotch. The people are mainly Gaelic speaking on the island of Barra which. From your first sight of Kisimul Castle the ancient seat of the Clan MacNeil, standing guard over Castlebay, you know you have arrived in a place were you will treasure the new memories you make.